Yarn labels or some people call them yarn wraps pack a lot of information and you'll need to know what it all means especially if you're following a knitting pattern. Knitting patterns will tell you what kind of yarn to buy for that knitting project. But there are other reasons as well. For instance you may want to substitute the yarn that is called for in a pattern, or you may want certain types of yarn like wool, acrylic or cotton. You may also want a certain thickness. All this information is wrapped neatly around your little ball of yarn. Note: Each company has their own label so the information may not be in the same place. Some also give more information than others but you should be able to find some information And once you know what to look for it's easy peasy. As you can probably tell I made this yarn label and I numbered the important elements so that it will help you understand. 1. The largest letters on yarn labels will be the company name. This one is My Yarns. I know it's not exactly the most creative. 2. It will list the actual weight and length of the yarn, this one is 7 oz/198 grams and 364 yards/333m. What's important to know is that you may pick up two different balls of yarn both weighing the same and maybe even looking similar but they may not have the same yardage. For instance you pick up a sock yarn that is 100 g / 3.5 oz and you also pick up another light yarn that is 100 gr / 3.5 oz. They may look almost the same but if you read the yarn wrapper you may find that the ball of sock yarn has 425 yards / 388 m and the other ball of light yarn has only 346 yards / 316 m.
3. Next is the color and color number. This is light blue and the color number is A123. 4. The dye lot (or lot) number is 456. Always check to make sure the dye lot numbers are the same. Even though the color may look exact it could be off just a tiny bit. This is really important too. I have bought two colors that look identical but they weren't and it does make a difference when you're knitting. If you can buy enough yarn for what you need in your project that would be great. It may be hard to match it up if you run out. I'm really bad for that. 5. The fiber content will be on all yarn wrappers. This one is 100% acrylic. 6. The next set of boxes show you the gauge and laundry care symbols. The first box on your left shows a ball of yarn that says medium and has a number 4 in the center. This means it is medium weight. The number in the center describes the thickness. Numbers for thickness start at 0 (thinnest) and go to 6 (thickest) according to the Craft Yarn Council yarn standards. 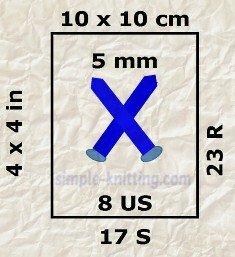 This section, the knitting needle symbol section, on yarn labels is the part that knitters need to take a look at. On my yarn label above it's the second box from the left. It gives you important knitting information for such things as needle size and knitting gauge. On one side of the box is 4 X 4 inches, at the top is 10 cm X 10 cm. You need to make a gauge swatch that is 4 inches wide and 4 inches long. The outside bottom of the box says 17 S (stitches), the right side 23 R (rows). This means that you will need to get 17 stitches and 23 rows in 4 inches. To narrow it down they want you to get 4.25 stitches per inch and 5.75 rows per inch. Here's where you can learn all about knitting gauge. The third box is very much like the knitting one only it's for crochet. It suggests a crochet hook size of I-9 (5.5mm). Using that size hook should give you a desired gauge of 12 single crochet (12SC) and 15 rows (15 R) in 4 inches (10cm). The far right box and the two bottom boxes are laundry care symbols for your yarn. After all it isn't going to be a ball of yarn for long right? Do Yarn Labels Have A Use Once You Finish Knitting? Yes possibly. If your knitting project was a gift you could include the yarn label with the gift. That way they can care for their hand made gift. It also may be an idea to take note of the yarn care instructions for yourself or hang onto the label so that you can remember how to care for the fabric as well. You can keep it with the swatch you made. You did knit up a swatch right? Note: Below I have listed some common laundry care symbols and their meanings. It wouldn't be right if they weren't included. And that way you have the yarn label symbols and the laundry symbols all in one spot. The dots on any laundry symbol represents how hot you can have the heat setting. One dot is the lowest. The more dots the hotter you can have the heat. They are universal in that you may see them for washing, ironing, dryers and so on. Any "X" on any laundry symbol means "do not"
Hope this helps. Happy Knitting!